24/7 But no Daytours on Sundays. There are 5 well marked routes offering a wide range of landscapes to hike on Ganora Guest farm. From a easy one hour long to about 5 hour route. The canyon route is very special where you might be able to see the Black Eagles at their nest. Come and experience the Karoo from mountaintop to meadow. A lovely canyon walk while watching the eagles fly above you is the ideal way to relieve your stress. To cool off you may swim in the Karoo pools en-route. Picnic baskets are also available on request. The canyon walk is a special experience and follows the trail from our farm to our neighbour. In the canyon you will find rock pools to swim in, depending on the water levels. The canyon has its own pair of Black Eagles. At times you will also see their youngster that they have reared learning to fly. We are willing to take your vehicle around to the end point, and the walk should not take you more than 3 hours from our homestead. Some people prefer to spend most of the day in the canyon and then return to Ganora. At Ganora you are welcome to go for walks anywhere on the farm. Some trails are easy while you may choose some more difficult routes at times. Then there is Compassberg, we can arrange a booking for you to go and climb the highest point of the Sneeuberg Mountain, which is 2502m above sea level. We do not advise this in the winter though, as it can get very cold and often has snow falls. From where you park your car it takes approximately 3 hours up and down. If you have a 4x4 you can go further and from there it will take about 4 hours in total up and down. There is a book where you can sign your name at the beacon. Trail 1 is a pleasant, shorter route that follows a ridge overlooking the farm before descending to sheep meadows and streambeds. The path passes a windmill as well as several small streams. Distance: 13.36 or 16.9 km. 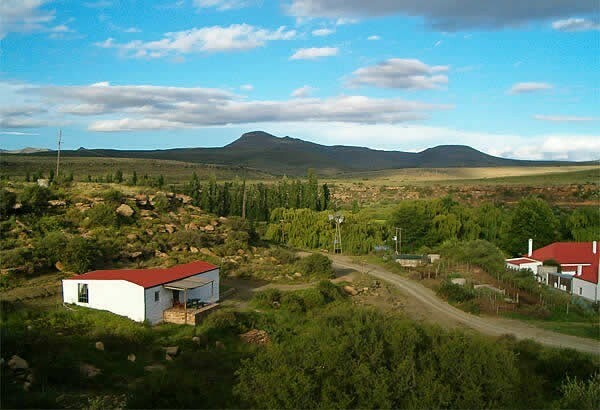 Trail 2 leads to a mountaintop on the farm with spectacular views of Compassberg and the surrounding hills. Along the way, the trail flows over undulating veld and a few sheep pastures. Hikers have the option of a longer or shorter route back to the main farm area. Trail 3 encompasses a wide range of Karoo landscape in its loop around the farm. The trail crosses sheep meadows, rocky hills, and many streambeds with water-smoothed stones. Trail 4 leads to the same mountaintop as Trail 2, but the trail passes a dam where flamingoes may be seen. Beginning on a dirt road, the trail becomes rockier as the climb up the mountain increases in incline. An option for a longer or shorter route allows bikers to modify the distance traveled. Trail 5 follows the river that runs through the canyon on the farm. Three options exist for hikers. The trail leads to a neighboring farmstall where we may park the hikers' car while they hike so that they may drive back to the farm. Hikers may also follow the trail to Nieu Bethesda, where we may park their car as well. A complete loop leads from Nieu Bethesda to the farm on the main dirt road, but this option is not recommended. In the canyon, hikers may spot a pair of eagles that nest on the rock face. Just before entering Nieu-Bethesda turn right onto the pink brick-paved bridge.Turn right at the second 4-way stop, into Hudson Street.Turn left at the third street, Naude Street with a small sign to MIddleburg and Cradock and Nieu-Bethesda station. After 5km you will find a turn off to the left, ignore this and continue another 2 km further to th Ganora Guest Farm & Excursions sign on the right-hand sign. Drive a further 1 km to find the homestead. Approximately half way to Graaff-Reinet on the you will see the "Gods Rehab" sign on your right-hand side. About 2km after you passed it, turn right at the Nieu-Bethesda sign. 20km further on you will see our turnoff to the left (signposted Ganora Guest Farm). 1km up this road you will find our homestead. Turn right just outside of Cradock to get on the Graaff-Reinet road. At the T-junction = Middelburg and Graaff-reinet turn towards Middelburg. After 500 meters turn left towards Nieu-Bethesda. After 20km.you will see our the turnoff to the left (signposted Ganora Guest Farm). 1km up this road you will find our homestead.